Posted on Jun 22, 2012 by Laura Franz. A serif font designed by Alexan­dra Korolkova, Olga Umpel­eva, and Vladimir Yefi­mov and released by ParaType in 2010. PT Serif is pri­mar­ily a Tran­si­tional font; it feels more “ide­al­ized” than “writ­ten.” It has more con­trast between thick and thin strokes than you’ll see in an Old Style font, and it has a ver­ti­cal stress. Ter­mi­nals and ser­ifs feel more styl­ized than pen-formed. PT Serif has a slightly larger x-height than Geor­gia, and holds up well at smaller sizes. It also pairs beau­ti­fully with its com­pan­ion font, PT Sans. 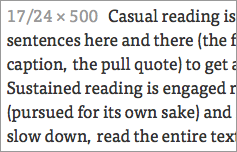 PT Serif holds up beau­ti­fully across browsers. It has the usual four styles and weights, and is avail­able via Google Web­fonts, Type­kit, and FontSquir­rel. Posted on Jun 15, 2012 by Laura Franz. A serif font designed by Erik Spiek­er­mann, Chris­t­ian Schwartz, and Kris Sow­ersby. Pub­lished by FontShop. Meta Serif (for print) was orig­i­nally designed as a com­pan­ion font to Meta. Meta Serif Web Pro is not merely a print font repack­aged for web use—it has been care­fully hinted and looks great on screen. I clas­sify Meta Serif Web Pro has an “Other Serif” font, because it does not fall neatly into any of the gen­eral his­toric cat­e­gories com­monly used to describe serif type. Ser­ifs look more pen-formed, while ter­mi­nals on the a and f look more drawn. The con­trast between thicks and thins is mod­er­ate, and feels more old-style, but the stress is decid­edly ver­ti­cal and feels tran­si­tional. All of these ele­ments meld grace­fully together to cre­ate a serif font with a slightly “square” or “struc­tured” feel­ing. Meta Serif Web Pro’s x-height is only a hair larger than Georgia’s, but retains read­abil­ity a bit bet­ter at smaller sizes. Meta Web Pro works cross browser. 4 styles are avail­able via type­kit. A total of 16 styles are avail­able for license directly from FontShop. It also works beau­ti­fully with its com­pan­ion font: Meta Web Pro. Posted on Jun 12, 2012 by Laura Franz. A human­ist sans serif font designed by Erik Spiek­er­mann and pub­lished by FontShop. Meta was orig­i­nally a print font designed for small text. The same ele­ments that helps Meta stay read­able at small sizes in print helps Meta Web Pro stay read­able on screen: open aper­tures, a gen­er­ous x-height, gen­er­ous closed coun­ter­forms, and slightly loose let­terspac­ing. Meta Web Pro is not merely a print font repack­aged for web use—it has been care­fully hinted and looks great on screen. Although Meta Web Pro has a decid­edly ver­ti­cal struc­ture, I cat­e­go­rize it as a human­ist sans serif due to its double-decker g, the curved stroke on the low­er­case l, and its human­ist italic. Meta Web Pro works cross browser. 4 styles are avail­able via type­kit. A total of 16 styles are avail­able for license directly from FontShop. It also works beau­ti­fully with its com­pan­ion font: Meta Serif Web Pro. Posted on Jun 8, 2012 by Laura Franz. If you’re look­ing for new ideas for pair­ing web fonts, check out Just My Type by Dan Eden. 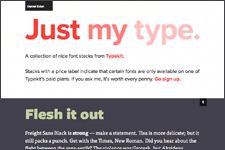 The site rec­om­mends font pairs using fonts from TypeKit’s col­lec­tion. 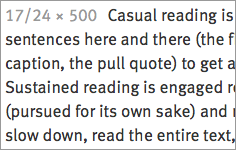 I can­not guar­an­tee that all web fonts shown are per­fect (I don’t know if they’ve all been tested cross browser for instance), but the pair­ings will cer­tainly inspire you. And it’s obvi­ous that Eden has a good eye for pair­ing fonts.